Taiwan is considered one of the strategic partners of the University of Danang (UD). Since 2005, UD has established cooperative relationships with many universities, institutions and businesses in Taiwan. A meeting was held on the morning of March 5, 2018 between UD and Taipei Economic and Cultural Office in Ho Chi Minh City. Attendees at the meeting were Mr. Luu Quang Chung - Chief Representative of the Office; Ms. Khang Ngoc Kieu - Deputy Representative; Ms. Au Quy Hy - Secretary of Education; Prof. Dr. Tran Van Nam President of UD, Dr. Dao Thi Thanh Phuong - Vice Rector of University of Foreign Language Studies and relevant leaders. Pointing out the cooperation and relations with Taiwan universities and enterprises, Prof. Dr. Tran Van Nam highly appreciated the big, enthusiastic support from Taipei Economic and Cultural Office. "In the future development of UD, I look forward to furthering the mutual cooperation, especially in cooperation with leading universities in Taiwan and extending to relationships with businesses. In addition to the fields of economics, science and technology, we will develop the humanities, sciences and foreign languages, ... " shared Prof. Tran Van Nam. 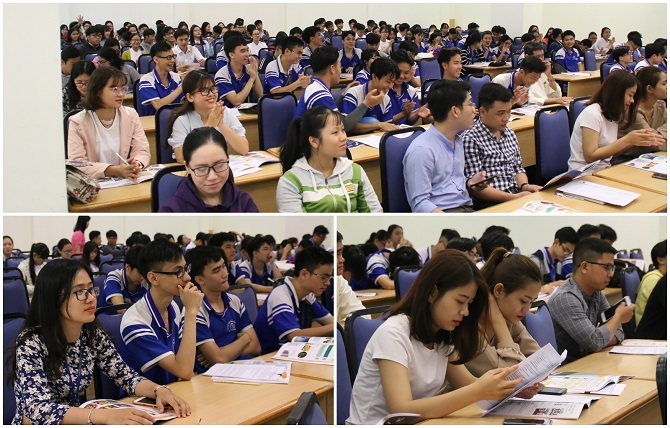 “According to statistics at the end of 2017, there are about 7,000 Vietnamese undergraduate and post-graduate students studying in Taiwan universities resulting from the signing of cooperation in the field of education between the two governments in 2000. On this occasion, more than 1,000 cooperation documents have been signed between 200 universities in Vietnam and Taiwan,” said Luu Quang Chung. On the quality of training, Mr. Luu Quang Chung emphasized the high appreciation of businesses regarding the capacity of Vietnamese workers trained in Taiwan. Through the meeting, he expressed his desire that UD and the University of Foreign Language Studies – UD will continue to promote and develop human resources in Chinese language training, thereby meeting the need of human resource of the Taiwan businesses in the region. "The office will create favorable conditions to support UD in human resource training and will also help Vietnamese students realize their dream of studying abroad," said Mr. Luu Quang Chung. On this occasion, UD also coordinated with Taipei Economic and Cultural Office to hold the 2018 Taiwan Study Day. The event attracted the participation of hundreds of students in the city. The students were provided with information about Taiwanese Government scholarships. “The scholarship aims to encourage elite Vietnamese students to study in Taiwan, thereby contributing to the cultural exchange and socio-economic development of Vietnam and Taiwan” – shared Ms. Au Quy Hy.